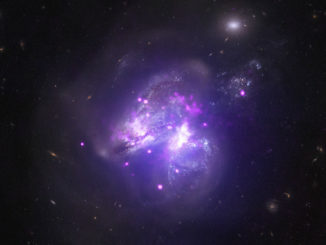 NASA’s Chandra X-ray Observatory spacecraft has spotted a chain of black holes, neutron stars or both in a huge necklace-like ring circling the aftermath of a galactic collision. The ring of very bright X-ray sources wraps around galaxy AM 0644-741 which collided with another galaxy (possibly the one visible at lower left in the above image) in the distant past. The collision generated ripples that propagated through the gas of AM 0644-741 (visible at lower right) and triggered the birth of new stars. The most massive of those stars would have quickly exhausted their nuclear fuel and exploded as supernovas, leaving stellar-mass black holes or compact neutron stars in their wake. Stellar-mass black holes typically have masses between five and 20 times that of the sun while a neutron star, the roughly 10-kilometre-wide (6-mile-wide collapsed core of an exploded sun, has a mass of roughly 1.5 times the Sun’s. At least some of the black holes or neutron stars circling AM 0644-741, some 300 million light years from Earth, are likely in binary systems, sucking away gas from their companions. That gas is heated to extreme temperatures as it is pulled in, generating the high-energy X-rays detected by Chandra. Interestingly, all of the X-ray sources seen encircling AM 0644-741 are so bright they are classified as ultra-luminous X-ray sources, or ULXs, producing hundreds to thousands of times the X-rays generated in a typical black hole or neutron star binary. 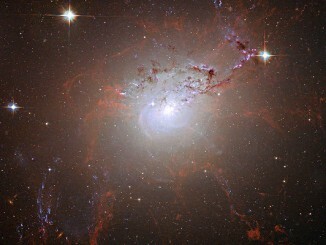 Astronomers initially thought intermediate mass black holes, with more than 100 times the mass of the Sun, were responsible for ULXs. But that idea fell by the wayside when a few ultra-luminous X-ray sources in other galaxies, including the famous Whirlpool Galaxy M51, were found to include neutron stars. It has been suggested that ULXs could be the result of unusually fast growth of black holes or neutron stars or, possibly, the result of viewing geometry as material is pulled in along magnetic field lines. As for AM 0644-741, astronomers do not yet know if the X-ray sources reflect a mixture of black holes and neutron stars or whether they are all one or the other. 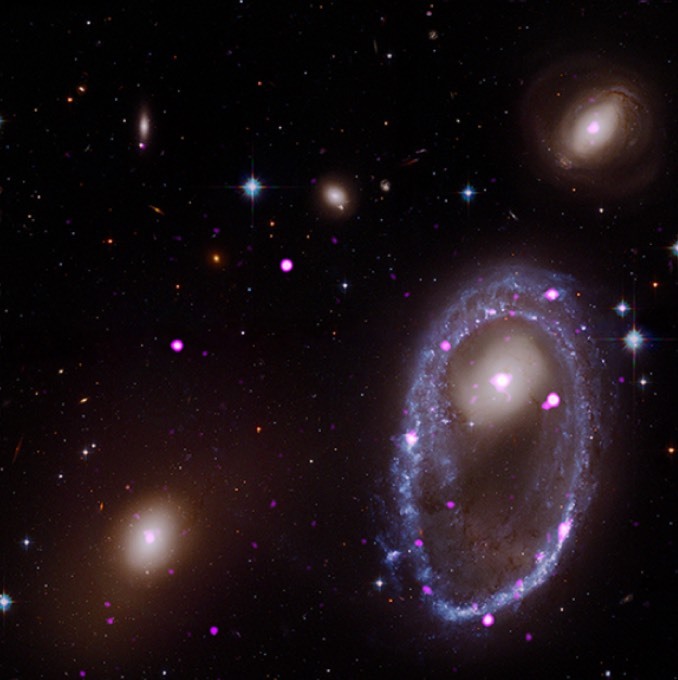 The Chandra study included observations of seven ring galaxies. Sixty-three bright X-ray sources were detected, 50 of them ULXs. The observations are discussed in a paper by team leader Anna Wolter from INAF-Osservatorio Astronomico di Brera in Milano, Italy. 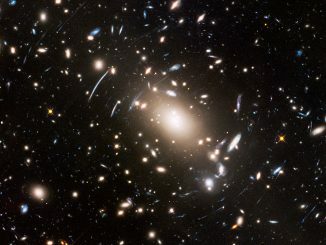 The TV series “Star Trek” captured the public’s imagination with the signature phrase, “To boldly go where no one has gone before.” The NASA/ESA Hubble Space Telescope doesn’t “boldly go” deep into space, but it is “boldly peering” deeper into the universe than ever before to explore the warping of space and time and uncover some of the farthest objects ever seen.